Iggy knows..... . Wallpaper and background images in the Maximum Ride club tagged: maximum ride max iggy fang total gazzy angel nudge flock faxness. "...in fact, why don't I just write a book about it? 'Why It's So Obvious Fang Likes Max" By Iggy, the blind kid, who seems to be the only one who's noticed." where is that quote from!! What book for cring out loud!!! "In fact, why don't I just write a book about it? "Why It's So Obvious Fang Likes Max". By Iggy, the blind kid, who seems to be the only one who's noticed"
It's from a FanFiction, I do believe. 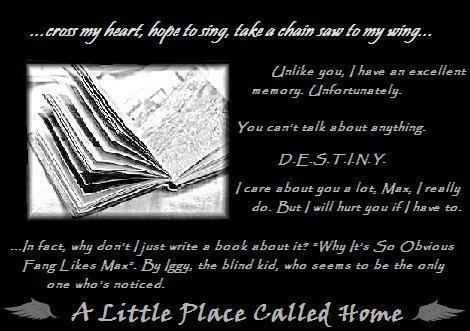 I know there's an MR FanFiction called 'A Little Place Called Home'. I haven't gotten around to reading it yet, though. Obviously, I should. I've read that FanFic! It's AWESOME! It's by Myrah, and there's a sequel called A Little Person Called God, but she discontinued it. I loved those stories. 2. He is being Iggy.